Having a French themed wedding? Then there's a lot to love about this favor: it's a miniature version the Eiffel Tower with beautiful details, it's practical and something your friends would enjoy using, and it's a great value! 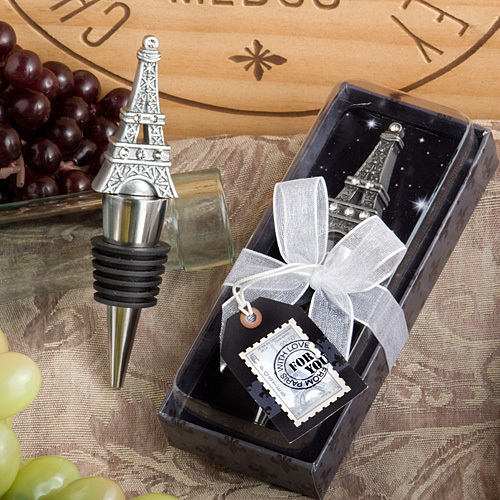 Also perfect for any Paris theme party - our Eiffel Tower bottle stoppers are pewter color poly resin (they are durable), have fine detail including shimmering rhinestones and feature a chrome finish silver metal conical base, wrapped with a black rubber gasket for a snug seal. Each 4 1/4" x 1" Paris favor arrives beautifully packaged as shown (in a clear showcase box with a charcoal grey base that features a black fleur de lis design). The box is wrapped with a white organza ribbon and has an attached Eiffel Tower postage stamp design “For You” tag.